"Knowing Him is half the battle". Click here to know Jesus Christ. G.I. 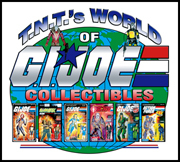 JOE BOOKS: Ron Conner & Derek R. Anderson created 3 books covering tons of GI Joe figures and various collectibles. Each book has at least 500 full color photos, and covers up to 400 different figures. Books cover items from the U.S & around the world. G.I. JOE TOYS SITE: Massive selection of figures and collectibles from around the world. Toys from virtually every country! ACTION FIGURE SALES SITE: An on-line action figure and collectible store serving collectors since 1999. Tons of different items, check it! G.I. JOE FAN SITE: T.N.T. 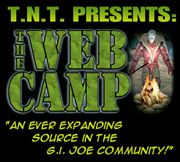 's Web Camp is an information site for anything G.I. Joe. Toys, comics, reviews, prototypes & more!